International referee since 1997, electrical engineer Carlos Arecio Amarilla Demarqui has seen it all: youth tournaments, qualifiers, semi-finals, finals and even World Cup matches. Among the more important matches Amarilla officiated, are the ones in u-20 Argentina (2001), the Confederations Cup (2003 and 2005), Copa America (2005 and 2007), u-17 Nigeria (2009) and almost countless Copa Sud-America and Copa Libertadores matches. Amarilla officiated three matches in the first round of the 2006 World Cup in Germany. He didn't get the best of press for his performances there. Particularly his management of Ukraine vs Tunisia, was heavily criticized. A match that WorldReferee regrettably failed to report on. We did cover the two other matches he officiated there: USA - Czech Republic and Togo - Switzerland. Carlos has a high card average; 5.3 yellow bookings per match and we could not find a match without bookings. This is partly explained, because most matches took place in South America and referees there seem to be more booking happy, though players and coaches should be warned by now. See his palmares. 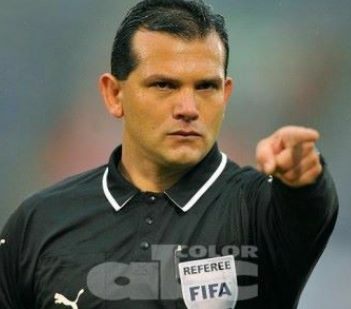 Carlos is regarded as one of South American top referees. He is been active in all major tournaments since 2001 and it was no surprise to see him been selected for the 2010 World Cup in South Africa. His second World Cup so far; there is a chance for a third appearance. WorldReferee reporters are giving him mixed reports and average marks.